The explicit investigation of anticipations in relation to adaptive behavior is a recent approach. 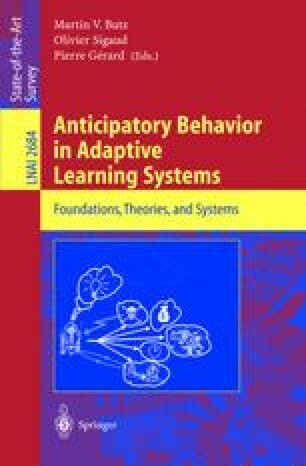 This chapter first provides psychological background that motivates and inspires the study of anticipations in the adaptive behavior field. Next, a basic framework for the study of anticipations in adaptive behavior is suggested. Different anticipatory mechanisms are identified and characterized. First fundamental distinctions are drawn between implicit anticipatory behavior, payoff anticipatory behavior, sensory anticipatory behavior, and state anticipatory behavior. A case study allows further insights into the drawn distinctions. Many future research direction are suggested.